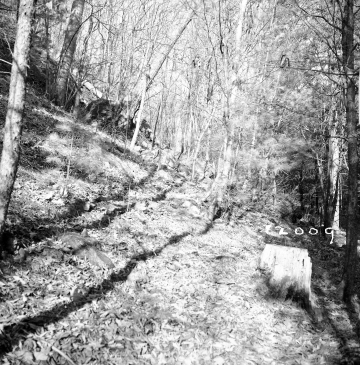 This black and white photograph looks north through a forest on the Dingler property, which is located near the future site of I-89 construction in Milton. Conifers and deciduous trees cover a steep hill that rises from right to left across the image. A tree stump stands in the right foreground, and several downed branches lie on the ground. Leaves blanket the forest floor. The season is autumn.